“Math has the potential to create links between different areas of science,” said Manos Papadakis, Professor of Mathematics at the University of Houston. Demetrio Labate and Manos Papadakis are mathematicians developing tools to solve challenges in neuroscience.Demetrio Labate and Manos Papadakis, long-time collaborators and professors in the Department of Mathematics, are creating these links by using their expertise as mathematicians to develop tools to solve challenges in neuroscience. “The tools that we provide enable neuroscientists to process large amounts of data so that they can define new phenotypic criteria, correlate structure and function, and accelerate discovery,” Labate said. Labate and Papadakis are working on a wide range of projects, all aimed at developing methods of analyzing fluorescent images of neurons. Their collaborators include scientists at the University of Texas Medical Branch in Galveston (UTMB), Baylor College of Medicine, King’s College London and Mount Sinai Hospital in New York City. “Our collaborators see differences in the images they have produced but often have no way to quantify these changes. Our role is to define reliable quantitative methods to determine change,” Labate said. One of these projects, done in collaboration with researchers at the Baylor College of Medicine, King’s College London and Mount Sinai Hospital in New York City, looks at small protrusions, called spines, on neuronal dendrites. Dendritic spines receive signals from a single synapse of an axon and transmit electrical signals to the neuron’s cell body. In response to environmental changes, such as drug treatment or stress, dendritic spines can grow, die or change shape. Understanding the mechanisms by which dendritic spines respond over time to stimuli and chemical interventions is a necessary step in unraveling how the brain adapts to different circumstances. For this project, Labate and Papadakis are devising mathematical methods to detect, characterize and quantify changes in dendritic spine morphology from large scale fluorescent images of neurons in in vitro models and brain tissue. Analyzing how dendritic spines change over time means Labate and Papadakis need to devise methods compatible with the types of microscopes and the qualities of images that these neuroscientists are using for their research. These data are gathered using high resolution fluorescent microscopy (confocal and two-photon microscopy) and processing these data requires special care. To analyze these images, Labate and Papadakis devised a mathematical method to automatically separate the biological region of interest from the rest of the image and extract meaningful features using specialized geometric descriptors. Using this strategy, they are able to provide a fast, efficient method for quantifying the change in the number and shape of dendritic spines. In another project, their collaborators at UTMB and King’s College London are treating neurons with potential pharmaceutical treatments, with the goal of identifying compounds that can either boost or restore synaptic activity. Reliably quantifying changes in spine morphology offer them an invaluable tool to assess the efficacy of their treatments. However, these image analysis methods have a broader impact, as they can be used as a tool to quantify neuronal morphology in other circumstances. 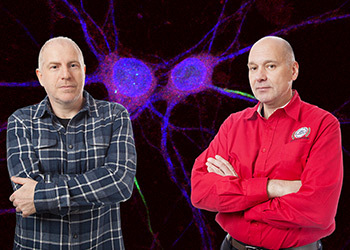 In a similar manner, the methods that Labate and Papadakis are developing for their other collaborations can also be adapted as tools to solve a variety of problems in neuroscience. “Our work has the potential to give a broad spectrum of tools to neuroscientists,” Papadakis said.